As the start date of the 2012 Olympics draws near, I cannot help but look at the money that was spent and is being spent by the government and shudder. The state of the English economy is appalling. Along with every other country in the world England is struggling to meet it’s financial obligations. Daily we are treated to more ‘knee jerk’ solutions to our financial dilemma. Pension ages have been raised along with the workers contribution, while the payable pensions are being reduced. Cutbacks, pay freezes, job redundancies, businesses going broke, public sector jobs being farmed out to companies who then hire workers at slave wages. I could go on and on about the financial horrors that the great English public are facing on an daily basis, but I think I’ve made my point. 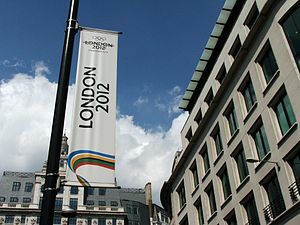 In eleven days time the 2012 Olympic games will officially commence. The amount of money that the government has spent on this ‘event’ is in the billions. I have no idea how much has been spent on advertising the games or how much has been set aside to ‘fund’ the torch relay that will culminate in the opening of the games. You can bet the bill is massive. Television advertisements are being shown as often as possible to evoke some sort of national pride in the games. With special emphasis being placed on the Paralympics and local news relaying the relay of the Olympic torch‘s progress. The British public is being inundated with coverage of the games before they’ve even started. But no one is asking the question, “Can we really afford to be supporting this?” This multi-billion pound ‘business’ venture that may or may not even pay for itself? The organisers can’t even afford to provide adequate security for the Olympic venue. G4S cannot come up with the physical numbers required so it has been decided that the military will have to help. The same military that, like other ‘governmental employees’, is having it’s numbers cut-back to the bone and is already massively over-tasked. I feel as though the British government is suffering from a huge amount of tunnel vision concerning the games and their possible net profit benefits to English coffers. The emphasis on the spectacle of the games has a “whistling through the graveyard” feel to it. Even worse is the knowledge that while the British economy is burning to ash and rubble, the government, just like Nero, are madly playing their fiddles while more jobs, lives, and businesses go up in smoke. 2012 has been a year of stiff competition. I still do several blog-posts per day and my views vary accordingly. I say accordingly, because there are a lot of factors that dictate how many, if any, views your blog will receive on any given day. For example, we have the 2012 Olympics going on just down the road. You have the football season. New video games and old ones (getting a DLC to correct the creators SNAFU on the original ending, is just one). Summer is also the season of the Blockbuster film. School is for the most part out. Holidays are historically taken in the summer months. People who have been glued to their computers, laptops and iPads are now going out and cutting their grass, having barbecues and garden parties. Basically the season of dithering and resting while waiting on warmer weather has passed. The only ‘constant’ is my posting to my blog. Of course you do get concerned when you check your view count and realise that it has increased by exactly one view in the last four hours. You tend to grumble and think why am I wasting my time. Don’t people realize that I live for high view counts? That my postings are like my party trick? Look mummy at how well I can write! Look at my broad topic range! Look, no typo’s! In essence I feel like a performing dog. Running through hoops and jumping flaming walls and hearing cricket noises when I’ve finished. I know, I’m over-reacting. My daughter calls me the “Drama King” and for good reason. Yes. I do exaggerate. But that is only for effect. I know that folks will pay more attention if I am telling a story about, oh, say…grasshoppers and the little buggers are in their millions. Grab’s your attention, doesn’t it? The mental picture of millions of little hoppers running around is much more eye-catching than hundreds of em. Yes I am complaining, but, I’m also oddly content. Because if I can get just one person to read my little post, I’m happy. One person that is not a friend or a family member. One person who is an actual stranger to me. This makes me happy. This fulfils the longing in me to be noticed for my talent. Okay so my talent equates to juggling three balls and very occasionally dropping one. But, minimal as it is, it is still a talent of sorts. Even if you think of it as the literary version of running off at the mouth.